I am very happy to announce that Mr. 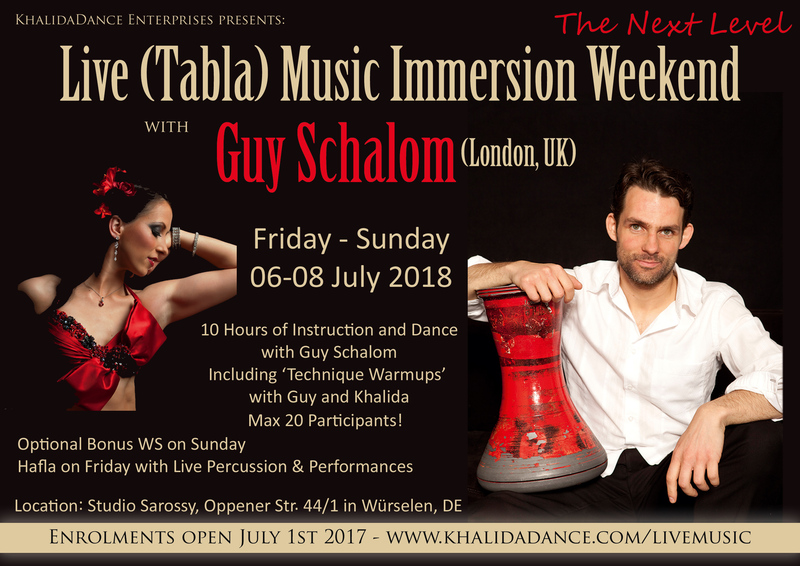 Guy Schalom (London, UK) will be back with us @ Sarossy Studio in Würselen, DE for teaching ‘Live (Tabla) Music Immersion: The Next Level’ on Fr-Sa July 06-08, 2018. A full weekend of dance and inspiration with a gifted and generous musician and instructor. Not to be missed! 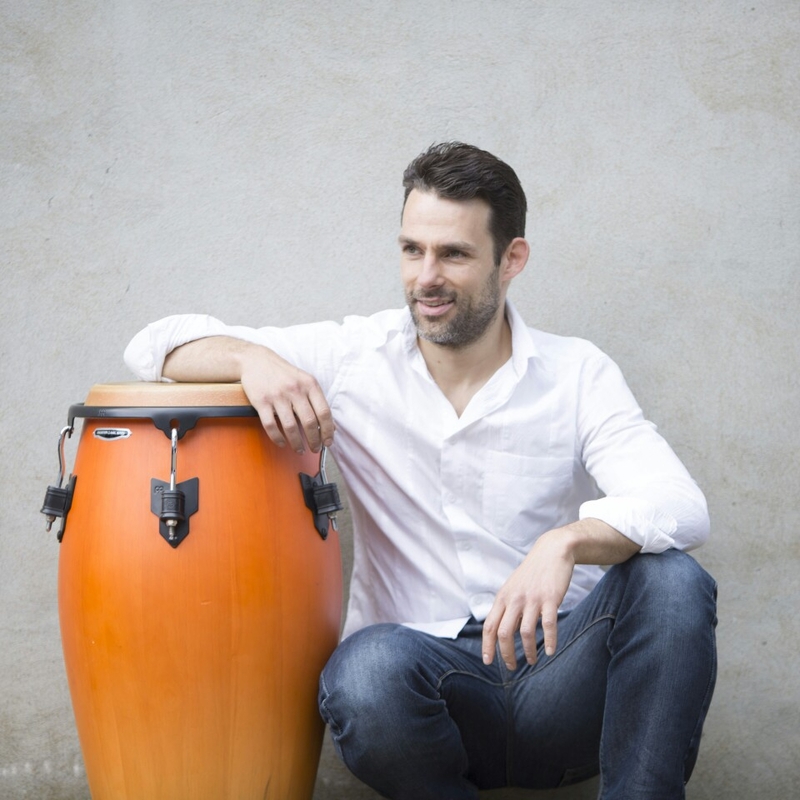 London-based Percussionist, teacher and band leader Guy Schalom has been described as “one of the most interesting and versatile percussionists working today” (fROOTS). His unique drumming style can be heard on countless movie, TV and computer game soundtracks as well as over 300 commercial CD recordings. Specialising in Egyptian music, Guy has performed with recording artists as diverse as Natacha Atlas, the Musicians of the Nile and Hijazy Metkal to name a few. He leads renowned Egyptian orchestra, the Baladi Blues Ensemble, having released eight CDs to date with several more scheduled for release on their 10 year anniversary in 2017. 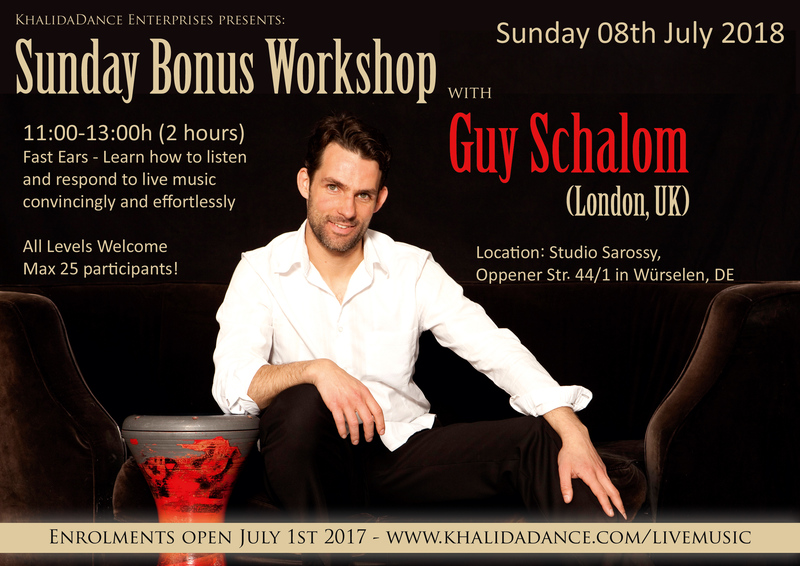 As a teacher, Guy Schalom brings together his formal musical education (Bachelor of Arts), his personal field research in traditional music and dance and over 25 years’ professional “on-stage” experience. Guy’s revolutionary teaching style continues to help thousands of dancers and musicians achieve their goals at festivals and events throughout North America, Europe, the Middle East and the Far East. Fr-Sa 6-7th July 2018: Live (Tabla) music immersion weekend package with Hafla on Friday evening. Egyptian rhythms in detail; communicating with and guiding musicians; tabla solo structure and interpretation; on-stage lead and follow; musicality, performance skills and improvisation; harnessing creative flow; peak performance practice; Egyptian music in context (talk). If you’d like to apply for a performance spot at the hafla please let us know via the enrolment form. After your enrolment you will receive a confirmation email with bank details. You can opt to pay either the full amount by bank transfer beforehand, or 50% of the workshop fee by bank transfer beforehand and the remaining balance (50%) in cash on the day of the event by selecting the corresponding payment option in the enrolment form. There can be no refunds for this event. In exceptional circumstances we do allow a transfer of your enrollment, in case you find another participant who is willing and able to take your place. The number of participants will be limited to maximum 20 for the Immersion Weekend (Fr-Sa) and maximum 25 for the Sunday Workshop. Enrollment forms will be processed in the order they are received. The nearest train stations to Würselen are Eschweiler Hbf and Aachen Hbf, each about 15-20 minutes from the studio by car. The nearest airports with good train connections to Eschweiler/Aachen Hbf are DUS (Düsseldorf) and CGN (Cologne). There might be carpooling options from DE, BE and NL for the event. After you enroll for the weekend you will get access to a (closed) ‘Rides and Roomies’ Facebook Group where you can connect with your co-travelers in search for roomies and/or carpool options. If you need any advice/assistance regarding travel and/or accommodation please don’t hesitate to email me via the Contact page. Past participants have stayed before at BnB Würselen, a simple but very conveniently located BnB, and at hotel Mennicken and hotel St. Jobser Hof in Würselen, DE – Other Hotels/BnBs near Würselen and Eschweiler can be found via booking.com. We look forward to welcoming you in Würselen, DE this July!